Purslane is the bomb. Google it. Amazing source of Omega 3 fatty acids. Here is a cool article about it’s many benefits. Combine olive oil, balsamic, salt and pepper in a jar. Put on the lid and shake vigorously. Set aside. Prepare the quinoa by bringing 4 cups of water to a boil, then adding the quinoa. Reduce the heat to low and simmer, covered for about 15 minutes, or until all the water is absorbed. 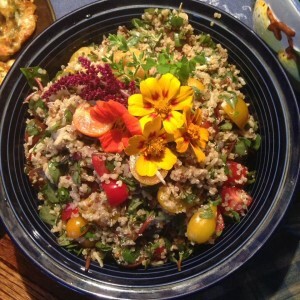 Pour quinoa out onto a baking sheet and spread into a single layer to cool quickly. Once the quinoa has cooled to room temperature, throw into a large bowl and toss in the tomatoes and mozzarella and the chopped Purslane. Stir gently while adding 2/3 of the dressing. Stir in the basil. After everything is incorporated, give it a taste; add more dressing if it needs it, or reserve the rest of the dressing for another use. Add more salt and pepper if needed. NOTE: It’s best to make this at least a couple of hours ahead of time and stored in the fridge. 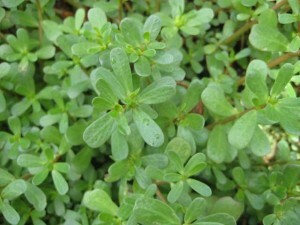 Here is a picture of Purslane, taken by The Wildfood Girl. Her site is wildly wonderful!